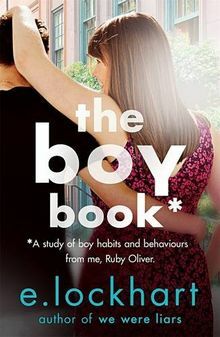 A Study of Boy Habits and Behaviours from me, Ruby Oliver From E. Lockhart, author of the best-seller We Were Liars, and the highly-acclaimed The Disreputable History of Frankie Landau-Banks, comes this hilarious and heart-warming series. Here is how things stand at the beginning of newly-licensed driver Ruby Oliver's junior year at Tate Prep: Kim: Not speaking. But far away in Tokyo. Cricket: Not speaking. Nora: Speaking--sort of. Chatted a couple times this summer when they bumped into each other outside of school--once shopping in the U District, and once in the Elliot Bay Bookstore. But she hadn't called Ruby, or anything. Noel: Didn't care what anyone thinks. Meghan: Didn't have any other friends. Dr. Z: Speaking. And Jackson. The big one. Not speaking. But with a new job, an unlikely but satisfying friend combo, additional entries to "The Boy Book" and many difficult decisions help Ruby to see that there is, indeed, life outside the Tate Universe.